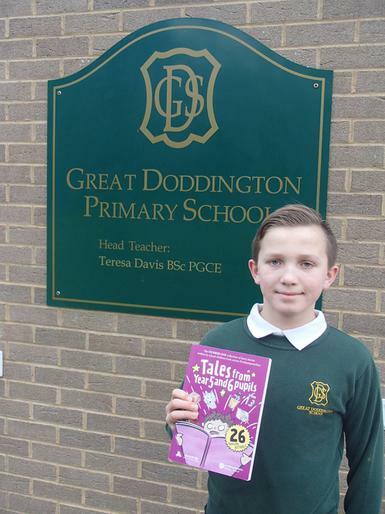 Congratulations to Oliver S, who was the overall winner in the Northamptonshire County Council 'Race To The Top' short story writing competition. He was presented with the final part of his prize, his story ('Endangered Species' - a clever twist on the zoo themed stories we wrote in class last year) published in a book along with all the other shortlisted writers. Great Doddington writers dominate the book, with 6 of the 26 stories written by members of class USA (other schools managed just one winner). Congratulations to the other GDPS winners (James and Olivia in year 6, and the 3 children who have now moved on to secondary schools, Anisha, Analiese and Jack W). A copy of the book, pictured, is now available to read in our school library.